Being 20% (or more) over your ideal weight as recommended by height/weight charts has been linked to increased risk of high blood pressure, diabetes, certain types of cancer, osteoarthritis, gallstones, and heart disease. Being overweight by even a few kilograms can also lead to a host of physical and psychological challenges. 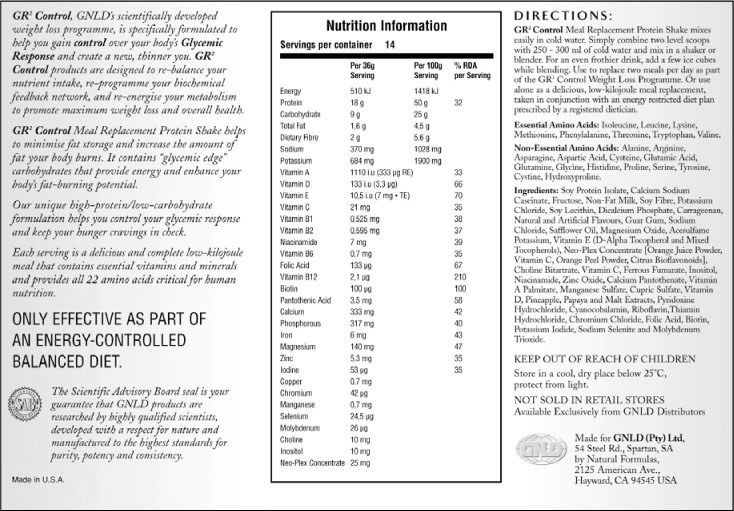 GNLD’s GR² Control Meal Replacement Protein Shake provides controlled-kilojoule, optimum nutrition, and our unique “glycemic edge” to promote good health and high energy. GR² Control Meal Replacement Protein Shake is scientifically tested and proven to be safe and effective. Why a Meal Replacement Drink for Weight Loss? Obesity can increase your risk of high blood pressure, diabetes, certain types of cancer, osteoarthritis, gallstones, heart disease, and premature death. The “insulin trap” can prevent your body from using stored fat as energy, causing weight gain and associated health problems. Fasting, skipping meals, extremely low-kilojoule diets, and other “fad” diet programmes can seriously jeopardize your health. Restricting food consumption reduces both the density and diversity of nutrients we receive. We need a complete daily supply of nutrients to remain healthy and active in order to successfully lose weight and keep the extra kilograms off. Why GNLD GR² Control Meal Replacement Protein Shake? Scientifically researched and formulated by the SAB/GSN. Includes correctly balanced amounts of vitamins, minerals, protein, fats, and carbohydrates to ensure fast, safe, controlled weight loss. Exclusive glycemic response formula helps to minimise fat storage and increase the amount of fat your body burns. Contains “glycemic edge” carbohydrates that provide lasting energy and encourage your body to stay in a fat-burning mode. Our unique high-protein/low-carbohydrate formulation helps control glycemic response and keep hunger cravings in check. Delicious and satisfying. 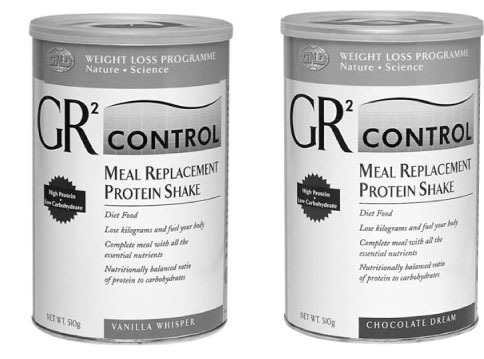 GR² Control Meal Replacement Protein Shake offers variety and taste satisfaction with two delicious flavors: Chocolate Dream and Vanilla Whisper. Mixes in water for ease, convenience and great taste. The taste of a shake with the nutrition of a meal! Choice of two delicious flavours, which easily mix with water! Balanced meal replacement. Each serving supplies at least 2/3 of the RDA (Recommended Dietary Allowances) for essential vitamins and minerals, plus a wide range of other important nutritional factors. Provides all 22 amino acids involved in human nutrition. Each daily serving provides more than half the RDA for protein when mixed with water. Exclusive glycemic response formula supports optimum weight loss and maximises energy.